Delicious has been hub of social sharing of weblink for sometime now. Previously it was owned by Yahoo under which it had lot of feature addition including dropping of dots from its domain name and becoming easy to remember delicious.com website. Now Delicious has new owner and it has relaunched in all new simple yet slick format. It introduces new Stacks or web playlist feature which allows you to bunch group of weblinks as one stack for quick social sharing. 1. 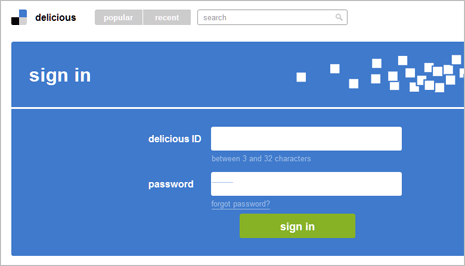 Open Delicious.com website and click sign in to login into your Delicious account. New users can create fresh Delicious account quickly from the homepage. 2. 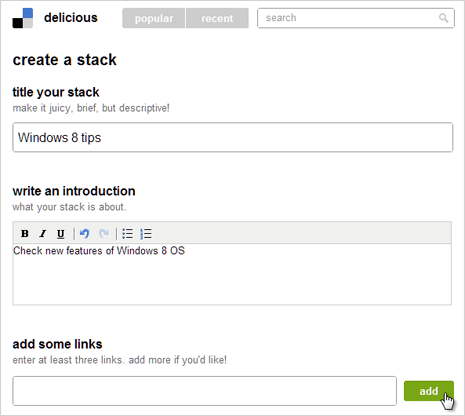 Once you login into Delicious account, click on Create Stack button at the top. 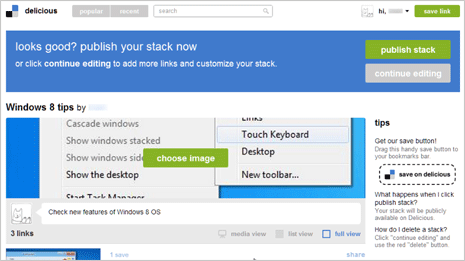 Then add title for your stack like ‘Windows 8 tips’. Also write description information regarding type of weblinks you will add into this stack. 3. Then paste weblinks and click Add button. You need to add minimum of 3 weblinks to create an active Stack. Once you add weblinks, click Preview button to see how your web playlist or stack look. 4. On the preview screen, click Choose image button. Select from either of image taken added weblinks. Make sure stack title image is relevant and attractive for more attention to your stack listing. 5. Then click Publish Stack button at top right. Your stack will specific weblinks will be live and is now visible to other Delicious users. If other user find your stack useful, they will open links listed in them and share further on Delicious. While this concept of bunching links is not new but the implementation for sure deserve credit – it is simple and quick, what say?